2018 is going to keep fans of motorcycle racing very busy, as this year will see the release of two-wheeled racers MotoGP 18, Ride 3, and MXGP Pro, all from developer Milestone SRL. Today we turn our eye toward MXGP Pro, which focuses on the rough-and-tumble world of motocross — you can check out fresh gameplay footage of MXGP Pro, below. 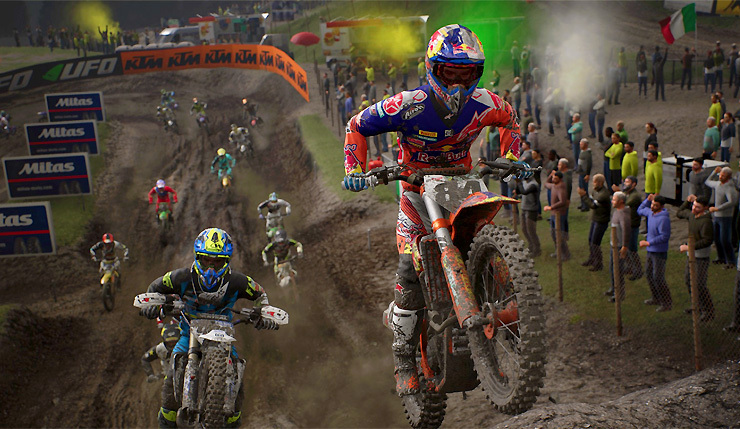 MXGP Pro lets you create your rider and climb the ranks in Career mode. Jump into the Compound, a bigger, wider training area with different terrain conditions. Test your skills facing 30 different challenges: a dedicated game mode to learn step by step the best motocross techniques in the most realistic way. After MXGP 3, we spent months and months reading all community’s feedback, which resulted in Pro Physics. Among all the player requests, there were a few constant things: free, realistic whips; more in-air control; ruts that influence how you take corners; clutch control for super-fast starts. Expect lots of features to increase realism: hard landings on short jumps, more seat bouncing, suspensions that actually matter. Beware, though, with all this realism the whole thing will be a lot more challenging as well! The MXGP games have always been solid (read our review of MXGP 3 here), but the series could be accused of being a bit stuck in a rut. It sounds like Milestone is making some real changes this year, so hopefully MXGP Pro leaves more of an impression than past entries in the series. The game’s new Unreal-Engine-4-powered visuals are also pretty impressive. Scope ‘em out in this trailer for the Compound training area. MGXP Pro roars onto PC, Xbox One, and PS4 on June 29.